What is your name and role within Beverly Kills? Alma Westerlund on vocals and synth, Viggo Mattsson on bass, Hampus Höggren on drums, and John Jonsén on guitar. Alma: We’re based in Gothenburg. And I’d like to describe Gothenburg as an active city, musically. There’s a lot of stuff going on here. I don’t think there’s ever been a Friday or Saturday night that I’ve been bored. What have you been working on recently? Hampus: We have been writing a lot of new stuff recently. Viggo: We also recorded a music video for our next single. Alma: Another edition of our zine is also on the way! Which bands are you digging from Gothenburg? John: Terra and Tyred Eyes are two of the bands I like the most right now. Viggo: Westkust’s latest record slaps! Agent blå and Kollapse are great too. Does living in Gothenburg influence your sound? Hampus: Not for me, at least. Viggo: I don’t think it influences us, but it might be something that affects us subconsciously. 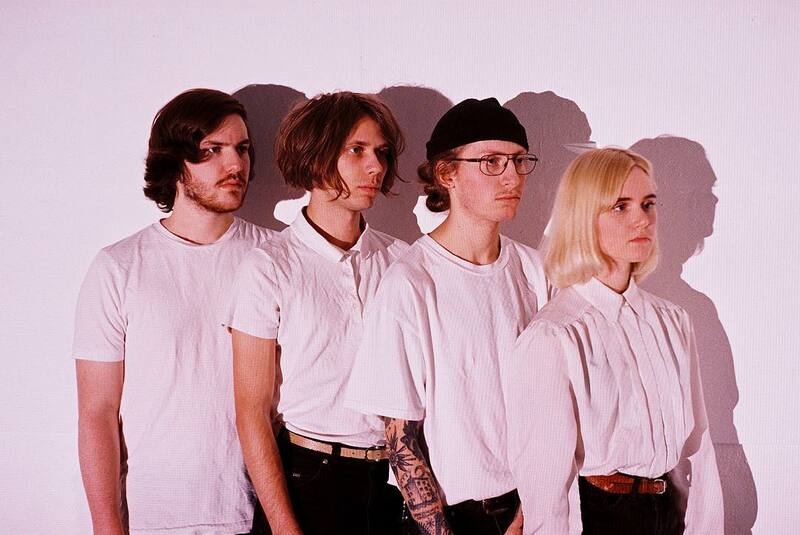 Bands like Broder Daniel and Makthaverskan are very typical for Gothenburg so it’s hard to be an active pop band here without getting somewhat inspired by them. What or who influences your songwriting? Alma: It’s hard to answer that question, because I’ve never heard anything and felt “that’s how I want to sound!”. Of course I have musical preferences, but I don’t think it affects how we write music. None of my favourite bands sound anything like we do, and I think that’s good. You’ve just released a new single ‘Revellers’. How did this track come about? John: Alma and I used to live in a shared flat with some of our friends, where we wrote our first tracks for Beverly Kills. Back then Alma still played guitar instead of synth, so all of her melodies used to be guitar parts. I sang on two or three tracks, and this was one of them. When Alma switched to synth we kept very few of our older tracks since they didn’t translate very well into our new sound change, but Revellers made it through. Hampus: We didn’t actually plan to record it, but we had some time left during the session when we did ‘Melodrama’, ‘Dreamless’ and ‘In This Dim Light’. And here we are! Where and when did you record and who with? Alma: At Welfare Studios, sometime around the beginning of March 2018. Everything was recorded with Kalle Lilja, Per Stålberg and Olle Björk. John: We recorded our debut single ‘Fourteen’ with them too, and we were so satisfied with how it turned out so it felt natural to go back there the second time around. What programs/instruments did you use? Hampus: They use Cubase for recording. Alma: I used my Micro Korg, with a Roland Space Echo RE-201. John: I always use my Fender Telecaster for everything guitar related. Viggo: And I used my Fender Jazz Bass. How do you usually go about writing music? Alma: John and I usually sit at home and write stuff together. We often record a quick demo and then we take it to the rehearsal space. When we wrote ‘Revellers’ and ‘In This Dim Light’ it wasn’t as easy to write vocal melodies, since we hadn’t rehearsed that much as a full band at the time. So I wrote all the vocal melodies at home, or on the bus at times. How did you come to sign from punk/indie Melbourne/Fitzroy label Hell Beach? John: When we released ‘Fourteen’ in August I tried to spread the song as much as possible, so I used SubmitHub for the first time in my life. We had some blogs who picked the song up, and one of them was Little Indie Blogs and Hell Beach found us through there. He sent a mail a few weeks after the song was out saying that he wanted to work with us. What’s the Hell Beach experience been like so far? Alma: It’s not easy having a record label on the other side of the planet. But Luke has been a pleasure working with, and he’s given us countless of good ideas and advice how to handle our social media. It’s lovely working with someone that understands you and understands where you want to go as a band. Where do you usually go out in Gothenburg and what’s a typical night out look like? Viggo: We begin at someone’s flat and drink a few beers at first, since alcohol is pretty expensive in Sweden. Then we usually hit up one of the bars at Andra långgatan, which is one of the more popular bar streets in Gothenburg. Alma: Most of our nights out are the same, but I think that’s the charm of it as well. That way it’s even more fun if something unexpected happens. You have a limited edition double single vinyl record coming out in April, what can we expect from this release? Viggo: It’s blue, for one! Alma: About eight and a half minutes of emotions. Why did you decide to release on vinyl? Alma: To make our parents proud! Just kidding. It’s amazing to have our music printed in physical format. John: But it was all Hell Beach’s idea really. Where will we be able to purchase it? Viggo: From the Hell Beach store (https://www.hellbeach.com/store/beverly-kills-in-this-dim-light-7-vinyl) and from our merch booth at live shows. What do you like to do away from music? Hampus: Watching movies, cooking and playing video games. Viggo: I love to draw and sometimes tattoo my friends. John: I like to eat good food and watching Netflix series. Alma: I’m a big fan of plants, but I’m too busy to take care of them so they always end up dying. Other than that, I like to read and to pet our bunnies that John and I have together. How did you first start playing music? Viggo: I don’t know really. Everyone I knew played guitar when I grew up so it felt natural to play something else, so I chose bass. Hampus: Honestly, I first got into playing music through the video game Rock Band on PS3. Alma: Music has always been a part of my life. There has always been different instruments around the house, but I started getting into it when I felt that it brought me so much joy. Fun fact – my first performance was at the local church, and I forgot the lyrics. I started playing guitar when I was 8, and everything that followed after that has been a way to express my creative outlet. John: I don’t know if I ever had a choice, to be honest. My father is a musician and works with production and mixing nowadays, and my mother was a music journalist when I grew up. I’m surprised that I didn’t learn to play guitar until I was 16. Alma: I’m more surprised that you didn’t revolt against your parents to become a soccer player instead. Any secrets that you care to share? Viggo: My guilty pleasure is the Instagram account @samantha_holic. What do you have planned for 2019? Alma: A lot. Viggo: Releasing more music and to play a lot more outside of Sweden. The second edition of our zine is coming as we mentioned. Alma: Drink a lot more beer, hang with more friends, write some more banging tunes. Favorite food and place to hangout? Hampus: The bar/restaurant Omnipollo in Gothenburg. Their Sloppy Joe is incredible. John: Eating a nacho plate at Kelly’s in Gothenburg. Alma: My killer Ceasar salad, and me and John’s apartment.